The Trump administration is proceeding with its strategy to build hundreds of miles of new border wall and fencing along the U.S.-Mexico border without first assessing the specific costs of those projects, according to a new report, putting the government at risk of overpaying for ineffective and delayed construction. In the infancy of President Trump’s term, Customs and Border Protection created the Border Infrastructure Program Management Office. It quickly requested supplemental funds to support Trump’s proposed wall and reprogrammed existing appropriations to contract prototypes. The agency expedited the process to accommodate the White House’s mandate, the Government Accountability Office found in a report released Monday, leading it not to consider costs when choosing locations for new border barriers. The administration has estimated that it will spend $18 billion to build 722 miles of wall, but that was based on an average rather than the costs of individual projects. Costs can vary significantly in each segment based on topography, land ownership and other factors, GAO said. The slope of the terrain, for example, can drastically alter the price of construction. The auditors previously reported on cost variance based on locations in 2009. In the San Diego region, GAO found that CBP has not documented an acquisition plan for the wall. It also has no up-to-date lifecycle cost estimate for the area. The auditors suggested that cutting corners now has the potential to backfire down the line. “By proceeding without key information on cost, acquisition baselines and the contributions of previous barrier and technology deployments, [the Homeland Security Department] faces an increased risk that the Border Wall System Program will cost more than projected, take longer than planned, or not fully perform as expected,” GAO said. While the administration has not properly assessed costs, it has considered the insights of Border Patrol officials, illegal entry data and an analysis of operations and engineering issues at each potential location. CBP spent $3 million contracting with six companies to build eight different wall prototypes. It tested those designs for three months, assessing qualities such as their penetrability and scalability. Border Patrol officials told GAO they did not plan to select one of the options, but to simply gather information on the strengths and weaknesses of each design. In February, CBP selected new design attributes. Officials determined, for example, that the bottom of the wall cannot be made out of concrete because it would limit Border Patrol agents’ view. CBP and the U.S. Army Corps of Engineers are in the midst of further testing on the new designs before widespread construction begins. The administration is facing significant restrictions in actually building using those designs, however. Congress provided funding in fiscal years 2017 and 2018 for fence replacement and new secondary fencing, but limited CBP to building only using designs already in place as of March 2017. That issue could soon come to a head, as Trump has repeatedly vowed to shut down the government later this year if his proposed wall is not funded without restrictions. 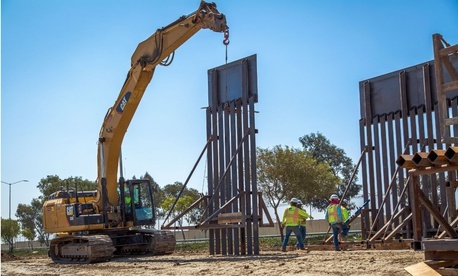 The White House sought $1.6 billion in border wall funding in its formal fiscal 2019 budget request to Congress, but has subsequently voiced support for a House spending measure that would provide $5 billion for the project. Trump has plowed forward with the shutdown threats despite their unpopularity. A Rasmussen poll that asked likely voters if they favored a shutdown if Congress “does not crack down on illegal immigration by enforcing security on the border with Mexico and building a border wall” found that 54 percent opposed the strategy, while just 38 percent supported it. The poll was conducted July 31-Aug. 1 and had a margin of error of 3 percentage points. The administration agreed with GAO’s recommendations to build more detailed cost estimates into its planning process and to develop a better acquisition strategy across all regions. It suggested, however, that it would continue to make its assessments on where to build based only on operational concerns before considering costs. GAO took issue with that strategy, saying demonstrated best practice in government is to analyze costs as a way to prioritize investments and maximize benefits while minimizing costs.